We have quite a few changes to the timetable following the exams, we have a couple of new classes but mostly its just time changes for existing classes. If you have any queries please get in touch. 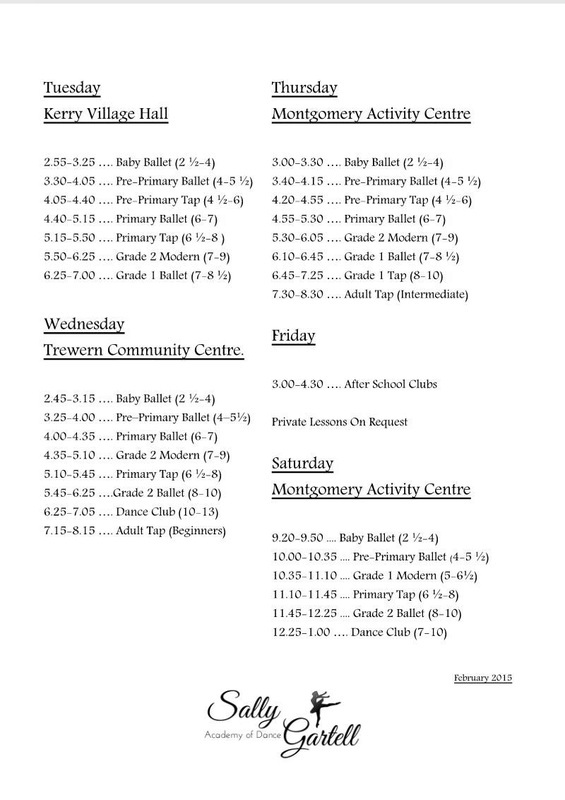 On Sunday 24th February we have Modern & Tap exams for those involved the coaching timetable is below. On Sunday 16th December we had a Disco party to celebrate the Christmas holidays. 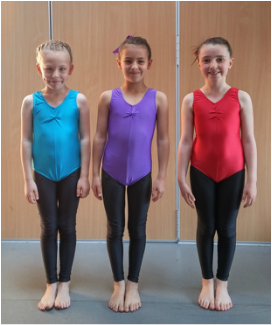 Our next Ballet exam session will be held on Sunday 11th November. Letters will be going out shortly. The timetable will not have too many changes in September we just have the addition of two classes. There will be a new Baby ballet class starting on a Thursday Morning in Leighton Village Hall this will be at 9.25- 10.00 hopefully this will help those busy mums who are doing the school run and can't make the 3pm classes. Adult Ballet has moved from a Tuesday lunchtime to a Wednesday lunchtime 1.30-2.30 at Montgomery activity centre. ​ALL Montgomery classes are now at the Activity centre until further notice due the refurb that is due to start in the Town Hall in October. Classes resume after the summer holidays starting on Thursday 6th September. There are a couple of new classes starting in May. We have a new Pre primary Tap & combined Modern Class suitable for children from 4 1/2 years on a Saturday morning at 10.20 & a new Primary Tap class suitable for children from 6 years on a Tuesday in Kerry at 4.40. ​If you would like your child to have a free trial please just let me know. After our next exam session we have quite a few timetable changes to fit some new classes in. I have tried my hardest to keep classes together where students do multiple classes and tried not to change days too much but sometimes i just cannot accommodate everyones busy time schedules. If there is a problem with your new times please get in touch asap. Classes resume after the Christmas Break on Thursday 4th January. ​Please note there are no adult classes on Tuesday 9th January. Our next exam session is on Sunday 29th October this will be for Ballet exams. ​If your child is being entered for these exams you should have already received a letter if you are unsure please get in touch. Classes break for half term after classes on 18th February we are taking a two week break so classes don't resume until Monday 6th March. Classes resume after the Christmas break on Monday 9th January. Please note there is exam coaching for those doing tap & modern exams in February on Saturday 7th January, please see timetable below. We have Modern & Tap Exams on Sunday 19th February coaching for these exams is as follows. We have a revised timetable for January 2017 to make way for some new classes after our December Examinations. Please pop over to the timetable page for more info. On Saturday 17th December we will be having our Christmas Party Pop over to the Events page for more information. We have exam coaching for the upcoming ballet exams on Thursday 27th & Friday 28th of October at Montgomery Activity Centre. We have a few adjustments to our timetable after half term. After many requests i've finally found a space to squeeze an adult ballet class in to the timetable! This will be on Wednesdays at 7.30-8.30 at Montgomery Activity Centre starting on 2nd November 2016. ​If you would like more information or to reserve a place please get in touch. On Saturday 20th August around 30 students performed at the Montgomery show. The weather wasn't the best but that wasn't going to stop us! and the rain did hold until we had finished dancing!! This was the first time performing for some students and they all did really well. What a fabulous day we had! The weather stayed clear for us although there were a few worrying looking clouds around. We had a fantastic audience for all our performances and everyone certainly looked like they had fun. I was an incredibly proud teacher!! Everyone achieved fabulous results with 12 Distinctions & 11 Merits. Two of our youngest exam students achieved a fabulous mark of 85 so I was a very proud teacher! We have a few performances coming up. This is a great opportunity for students to perform and lots of fun too. If you are not involved please come and watch us. We have a few changes to the timetable after half term so please make sure you have received the latest timetable. Cost … £49 each this includes the return coach trip. The coach will be leaving from The Sun Inn at Marton at 5pm. Payment needs to be made by 30th June 2016. We break for Christmas after classes on Saturday 19th December. Classes resume from Tuesday 12th January. Dont forget the Christmas Party on Sunday 20th at Montgomery Town hall. More info can be found on the events page. I hope you all have a very restful Christmas. We've had a lots going on since the summer holidays with our first exam session and the annual Tapathon for Children in need. You can read all about these events in the December Newsletter. Over the past few months I've been working with Keith Williams of Sprout Uk, a very talented graphic designer, who has been helping me to re-brand. We have redone the school logo and Keith has helped me produce some very lovely promotional leaflets and adverts to help grow the school and make it stand out from the rest! If you have anywhere you can put some leaflets or flyers please let me know and I will get some to you. Mon 21st – Sat 26th Sept ….. No Classes This Week. Mon 9th – Sat 14th Nov ….. Fancy Dress for Children in Need Week. During the summer holidays I will be running a few classes for those interested and exam coaching for those being entered for examinations. Classes will be held on Thursday 6th, 13th & 20th at Montgomery activity centre, places for summer classes do need to be pre booked at £4 per class. 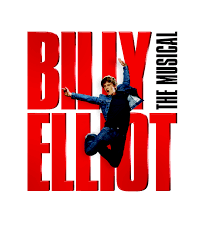 On 8th September we will be starting a new adult tap class at Montgomery Town Hall from 8.00-9.00pm. On Saturday 4th July we are once again participating in the Montgomery Street Fair. If you have anywhere you can display a poster please let me know. We had a lovely party on Saturday 13th December with a disco and lots of games. There was mountains of lovely party food provided by everyone that came. The children all looked like they had lots of fun. Thank you to everyone that came and all those that helped out too. We are participating in the annual tapathon for Children In Need & The Guinness book of Records Attempt. If you are not involved please come and support us at 12.45 -1.15pm. This year I decided to hold a Christmas party for everyone to let their hair down at the end of term. All students are welcome with their best party dresses to the disco party with DJ Tony Rowley, for an afternoon of fun, dancing and party games!! Sunday 14th December ….. Adult Tap Christmas Party Meal . 15th - 20th December ….. Watching Week. All parents are invited along to watch students usual lessons with an added dance routine in some classes!! I have introduced new T-shirts, uniform for all dance club & mini movers classes and optional for Tap classes Priced at £9.50 available to order now! Lots of new classes have been added this term so please take a look at the new timetable. I will hold a baby ballet class which will run as a regular class from 2.30-3.00 pm £4 per class. I will then hold a fun workshop class from 3.15 - 4.15 pm where I will choreograph a couple of dances to both classical and pop music so children can experience Ballet & Modern dance. These classes will run for an hour at £5 per class, depending on the uptake I may run two classes one for 4-6 year olds and one for 6+. If you would like your child to participate please let me know by Tuesday 29th July so preparations can be made. On Sunday July 13th I am holding a photo shoot & hair workshop at Montgomery activity centre please go to my events page for more info. If you would like to come along please contact me to book a place. The Photoshoot & hair workshop was a lovely event, i've already seen some lovely buns in dance classes!! Photos are available to view and purchase on Mairi Turners website. Photos are password protected so if you're unsure please ask. I will be starting new classes on a Saturday as of September please see timetables for more information regarding classes and times. Please get in touch if you are interested in joining one of these classes. Timetable not yet confirmed. There is a new adult body conditioning & movement class starting on Wednesday 30th April 7.30-8.30 at Trewern Community Centre. This class is on hold until we have more interest. There will be new classes starting in Kerry village hall from Tuesday 29th April. On Saturday 11th Jan we were asked to perform at The Montgomery Town Hall for the seniors Christmas party. 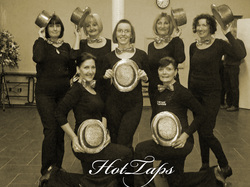 So my lovely adult tappers and I put a few dances together and had great fun doing it. We had so much fun that we decided 'why stop now?' We already have our next date booked!! Please note term dates for Shropshire and Powys vary for the first term only. We have new beginner tap classes on Monday evenings 7.30-8.30 at Worthen Village Hall starting February 3rd. 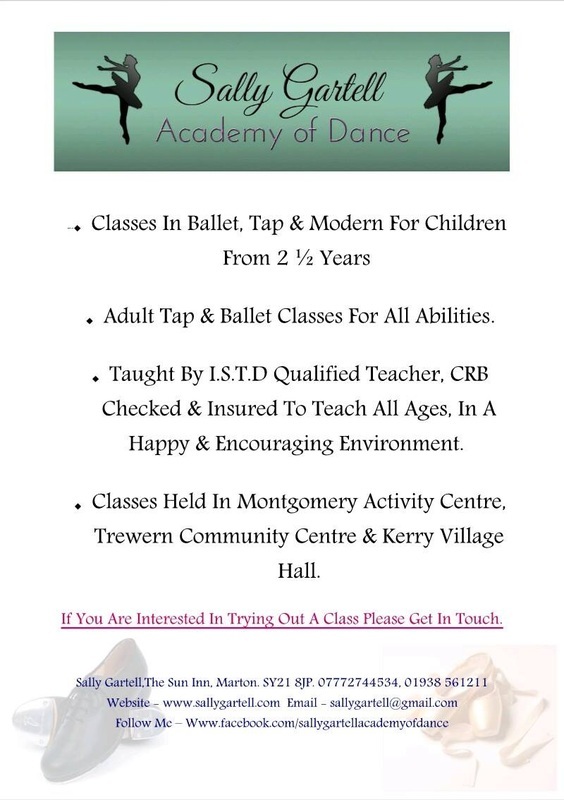 Next term we will be starting a new tap class in Trewern aimed at children aged from 5 please get in touch for more info. On Saturday 21st Dec many students and parents got together for our end of term show and party, and what a lovely time we all had. Many of the students performed dances whilst others watched and applauded. We followed this informal show with a great party, everyone brought something to add to the tea party, we played some games had great fun whacking the ballet shoe pinata and burnt off lots of energy dancing to the Christmas music. I would like to say a huge thankyou to all those that helped out and all those that just came to watch and join in with the party fun. Take a look at some of the photos! Uniform can now be purchased directly through the school, please get in touch for a price list. Payment needs to be made when order is placed.